Michael Flynn May Have Broken The Law In Taking Russian Payments, Lawmakers Say : The Two-Way The heads of the House Oversight Committee described "troubling" classified documents about former national security adviser Michael Flynn, and said the White House is refusing to release some data. House Oversight Committee Chairman Jason Chaffetz, R-Utah (right), and ranking member Rep. Elijah Cummings, D-Md., speak to reporters about Michael Flynn, President Trump's former national security adviser, on Tuesday in Washington, D.C.
"I see no data to support the notion that Gen. Flynn complied with the law," Chaffetz said. Flynn was paid tens of thousands of dollars for appearances he made in Russia, including payments from a Kremlin-backed media organization. He was also paid for lobbying efforts that may have benefited the Turkish government. As a retired lieutenant general, Flynn was required to obtain permission before receiving foreign payments, Chaffetz and Cummings say. But the classified briefing they received suggested Flynn neither asked permission nor reported the funds he received for a trip to Moscow. 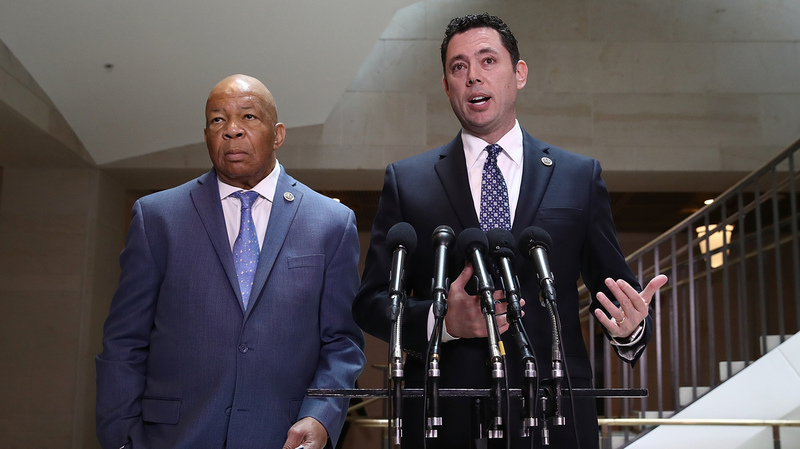 "It does not appear to us that [permission] was ever sought," Chaffetz said. He noted it will be up to the Department of the Army to make a final determination on whether Flynn broke the law. Flynn's lawyer said in a statement that the former general discussed his trip with the Defense Intelligence Agency, both before and after his travel, and "answered any questions that were posed." The lawyer did not address whether Flynn specifically informed the Pentagon about payments. "As a former military officer you simply cannot take money from Russia, Turkey or anybody else, and it appears as if he did take that money," Chaffetz said. "It was inappropriate and there are repercussions for the violation of law." Cummings said they could not discuss the contents of the classified documents they saw. "But we can say this: They are extremely troubling," he said. "I believe these documents should be declassified to the fullest extent possible." Cummings also said the White House has refused to release information about Flynn's foreign contacts and connections. The House Oversight Committee had requested Flynn's security clearance paperwork, references to foreign contacts, receipts for payments from abroad and requests for permission to receive foreign payments. Each request was denied. The administration had a range of reasons. In a letter on Wednesday, the White House referred some requests to the Department of Defense, claimed to not have "possession, custody or control" of other documents, said some files are "likely" to contain classified information, and questioned the relevance of other documents. "The White House has refused to provide this committee with a single piece of paper," Cummings said, "and that is simply unacceptable." At a news conference Tuesday, White House press secretary said some documents had already been handed over by the Department of Defense. He also suggested that it would be "outlandish" to provide the committee with information about every call Flynn made as national security adviser. Asked whether Flynn had broken the law, Spicer said, "that's a question for him."